About the build break on the Ubuntu 11.x that was mentioned last time, Scott McKenzie has posted a new patch, you can find it in https://github.com/cgjones/android-build/pull/1/files. I have not tested this patch yet, please let me know if you find it ok.
Another thing worth to mention is that Henri has posted a new ethernet patch for Honycomb branch. Before Chih-wei accept/merge the patch, you should be able to find the patch in http://mansoft.nl/android/ethernet.diff.tar.gz. 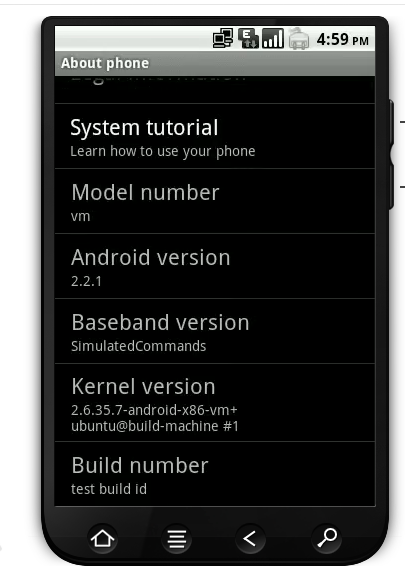 I will upload it to the download section of android-x86.org as well. It seems that this issue only happens on Ubuntu 11.x where a newer GCC is installed. Ubuntu 10.04 seems to be ok.
Android-x86 has a nice feature for the touch only device (no to have a button at all). If you touch the right corner of the status bar, it enables a touch mode that allows you to simulate the home/menus buttons through some touch actions on the status bar (see http://www.android-x86.org/documents/touch-only-device-howto). With the Amazon test drive, when you click the right corner of the status bar, you will see a dialog showing up on the screen that tells you to wait for the function to be turned on. Even though the full feature does not work with the Amazon test drive, but it proves that Amazon is using our software. Amazon Test Drive Use Android-x86 !! @bluestacksinc found Amazon Test Drive might run the android apps on andorid-x86 in Amazon EC2. Hi, @Amazon, thank you for choosing Android-x86.org ! !